The whole choice is copper. This loop is made of 50cm of 4mm "soft" tubing. 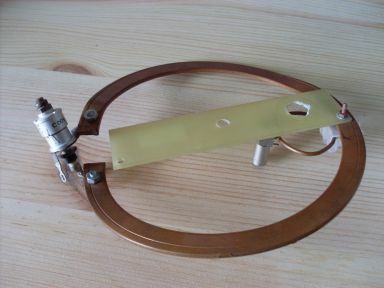 The capacitor of two 1mm circular plates with about 3cm diameter torch-brazed to the loop conductor. The coupling loop is made of 1mm solid wire and held by a luster terminal. Tuning is done by bending the loop to in- or decrease the capacitor plate's distance. 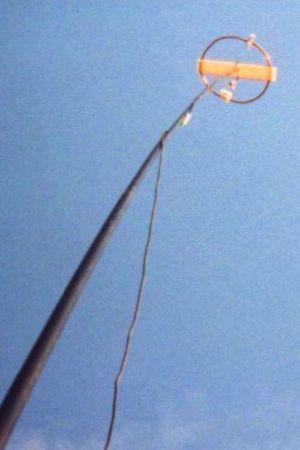 The whole thing is than strapped to a bar of plastics with a tiny whole in it's center of mass to be skewered to my fiberglass telescopic mast. The main concern with copper is, that it corrodes. Remember, skin effect... Some finish should be applied to protect the conductor's surface. 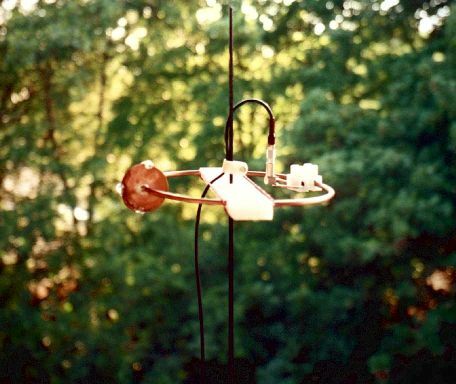 Such kind of omnidirectional antenna gives the possibility to be QRV with horizontal polarisation, as commonly used for the CW and SSB section of the 2m band. This actual design shows a 1.3:1 bandwidth of about 150kHz, centered to 144.200MHz. The SWR on the lower end of the CW section still allows transmitting. The aerial gave good results on the local rag chew at 144.350MHz (using 10W pep) with the clear advantage of the directional diagram of a "lying" magnetic loop. Do not believe people telling you that this kind of antenna does not work for higher frequencies. It will not make you QRV from the basement, but held up in the air, to the same hight you would lift a beam to, it performs really satisfatory.